We have shown this letterbox last July, but its makeup was a bit worse for wear at the time. Over the Christmas period new lipstick was applied, and Wow! I found out that the maker of the letterbox (at 452 Huia Road) is Iain Cathcart, whose mother Ida lives not far from us and who we meet from time to time. 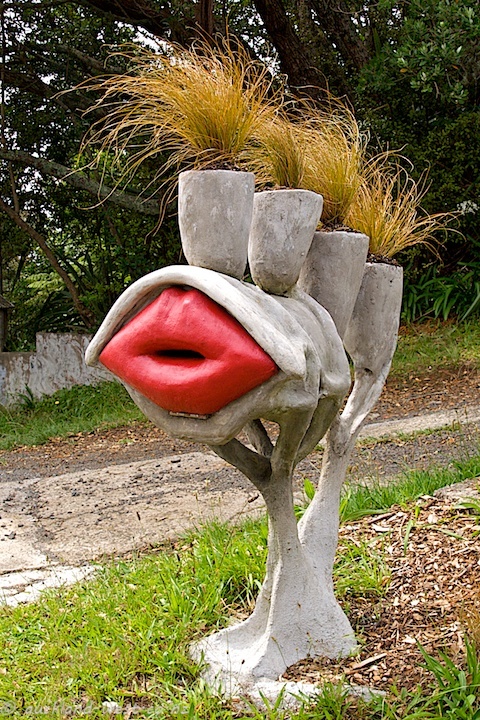 Moreover, this box was the inspiration for David and Geraldine Bayly, from the Kaipara Coast Plant Centre & Sculpture Gardens in Kaukapakapa, to run a design competition for weird and wonderful letterboxes – which was also won by Iain. See more at the designdaily. See also the NZ Herald’s Sideswipe on February 3 and February 4. That is the most unusual letterbox I have ever seen. And one of the coolest. I have never seen anything like it! This is great. We had neighbours once who were southern European and they build the most hideous huge tiled letter box. Then again we had garden gnome cemented to a rock left by the previous owner and too hard to remove … perhaps they thought we were hideous too.